When drivers hear this name they know that not only is the season coming to a close, but that they are about to drive out of the garage onto one of the most prestigious circuits on not only the GPVWC Superleague calendar but the Formula One calendar as well. Named after Brazilian F1 driver, Carlos Pace. The 4.309 kilometres (2.677 miles) boasts some of the best action the fans will get to see throughout the season. Much like the Circuit of the Americas before, we are greeted by a mix of sweeping corners and tight, technical and tyre destroying sections mainly inside the second sector. Whilst the Suzuka circuit boasts being the home of title winning races for the greatest drivers. Interlagos boasts being the home of, in most people’s eyes, the single greatest Formula One driver of all time. Welcome to the Eyes Forward for the penultimate round of the 2018 Grand Prix Virtual World Championship Superleague season. One in which, once again, could mean the title is wrapped up a round early by Alex Siebel. Last time out at the Cirtuit of the Americas we witnessed exhilaration and heartbreak alongside an Edge Esports first. Qualifying 1st and 2nd on the grid locking out the front row for the first time in the team’s history after two outstanding laps put Brljak on the pole with Teien alongside. An amazing qualifying was then followed by an amazing show of pace in the early phase of the race with Brljak slowly pulling away from Teien of whom was acting rear gunner for the Croatian fending off title leader Alex Siebel. Throughout the rest of the race is was Brljak’s day. No drop in pace and a fresh engine allowing him to max his potential and keep the gap to Siebel and take the victory by a dominant 13.6 seconds. For Teien however. The luck just was not there for the Norwegian. Coming into the race with a dying power unit his pace was already off what Siebel and Brljak could do on race pace but to add insult to injury only ten laps from the chequered flag his engine gave out into Turn 16 and ended the team’s hopes of scoring a double podium and closing the gap in the constructors to ACR Zakspeed of whom finished P2 and P7 after a shocking race for Kappet. After Brljak’s, dominant, victory at the US Grand Prix it means that the gap between himself and Siebel drops by another 5 points coming into the penultimate round. What this means is that the title implications change although they are extremely less in favor of the Edge driver. 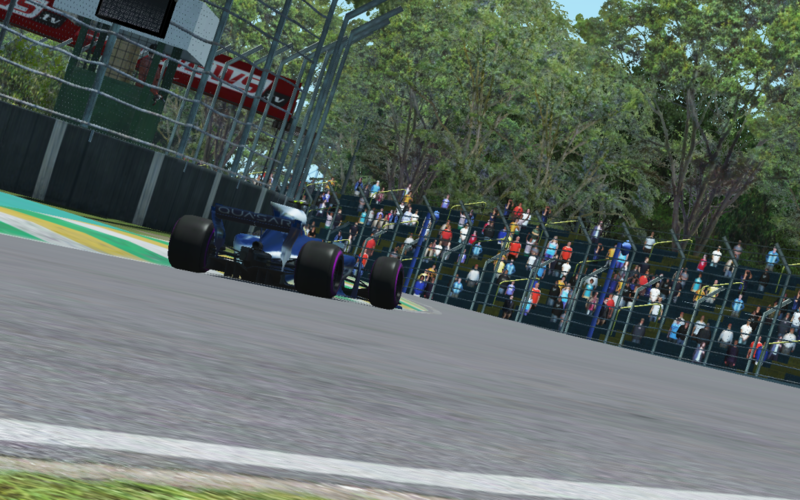 Brljak Wins – Siebel P5 or lower. Brljak 2nd – Siebel P8 or lower. Brljak 3rd – Siebel P12 or lower. Brljak 4th – Siebel P15 or lower. Brljak has his work cut out for him if he wants to win this year’s title but he is more than capable of finishing ahead of Siebel. For this round luck will need to be fully on his side if he wants to have a shot going into the final round at Abu Dhabi. In the constructors standings things just got harder. After Teien’s retirement with ten laps to go it meant that ACR Zakspeed claimed four points over the Edge Esports squad coming into Brazil. To remain in the Constructors Title fight, Teien and Brljak will need to amass a total of three points over the ACR Zakspeed squad on Thursday to be within the 45 points limit coming into Abu Dhabi. So not only is the pressure on in the Drivers Championship but it is very much on in the Constructors Championship. As we look ahead to Thursday and the 71 laps and 305.939 Kilometres (190.076 Miles) that confront the grid of 14 teams and 28 cars, we can be certain that the 2018 GPVWC Superleague Brazilian Grand Prix will be one for the history books. 18 years and 16 different winners alongside a certainty of a new winner at this racetrack gives us some incredible racing to look forward to. Will you be there to watch history? Join us on Thursday the 25th of October on the GPVWC YouTube channel LIVE at 20:30 CEST for what will be another unmissable event!